I have been browsing this forum for the past few days growing increasingly impressed and nervous in equal measure. 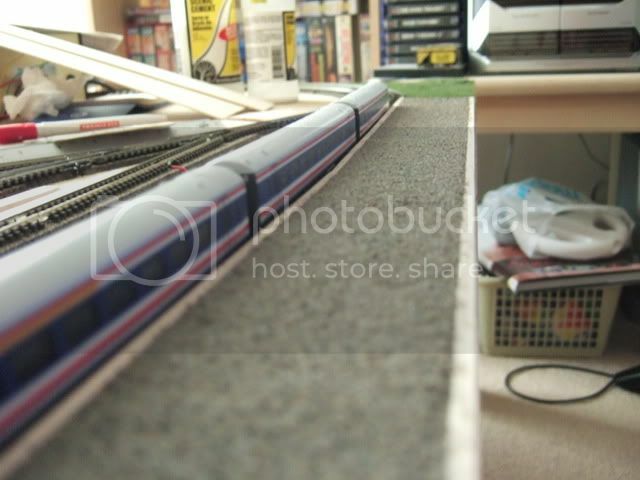 Impressed because there are some really lovely layouts on here, and nervous because mine, “Filton TMD”...isn’t quite up there yet. Before I describe my effort, just a brief word or two about myself and what my modelling is about. Firstly, railways are a bug that bit me young. Apparently I saw my first train going over a bridge in South London and was a lost cause ever since. It was a Network Southeast EMU that was running through my (then) local station Raynes Park. 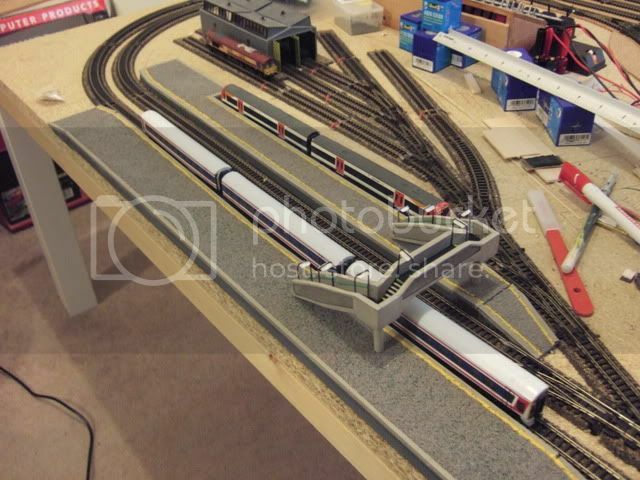 This should, logically, mean that I grew up a fan of all things sparky third rail, but I regarded the trains running around my local patch as “boxes” without “proper” locos (this has since changed, I am growing to like model DMUs and EMUs a lot). My favourite train was, and is, the Class 43 / HST (or as I insisted on calling it back then, “Intercity”). To me, getting on a HST meant I was going somewhere far away, somewhere exciting. Oh, and there was / is the noise! Few noises have stayed with me and make the hair on the back of my neck stand up like a HST starting or revving up. It’s up there with the spectacle of hovering Harrier, a Vulcan go-around and Formula One engine screaming around Wembley Stadium. Anyway, the layout. I model what used to be called “modern image”. I like steam engines, but I am far too young to have grown up with them. My chosen period for “Filton TMD” is the privatisation cross-over period. This period was chosen as I happen to think that the BR sectorisation triple-grey is the best livery ever applied to mainline diesels, I think the “Swallow” livery suits the HST the best and Network SouthEast is great on just about anything! However, my loco fleet also includes class 66 and class 67 locos, and seeing as these were never a part of the BR plan, EWS is allowed too. Oh yes, spot the deliberate mistake! I know that the 67 came along way after BR was officially gone, but I operate a strict policy of “if I like it, I run it” and so both regional and historical anomalies can be found on my metals. Filton TMD was started in 2007 as a way of displaying a growing collection of locos that, until then, were stuck in boxes in London after I had moved full time to Bristol (after graduating from Bristol Uni). 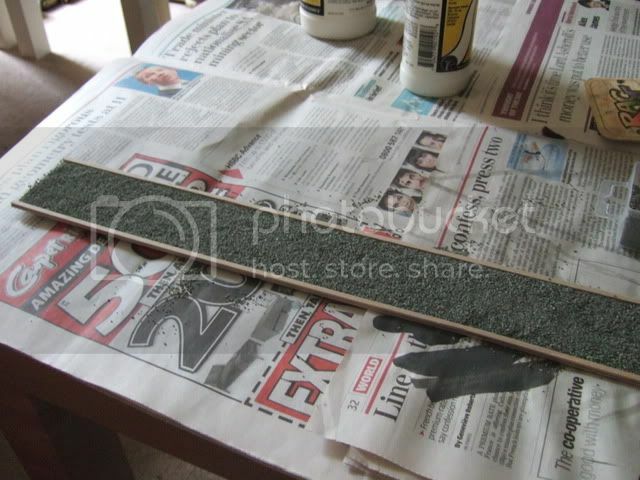 I had a big baseboard that was built for me by my mum in her house, but it was far from transportable. 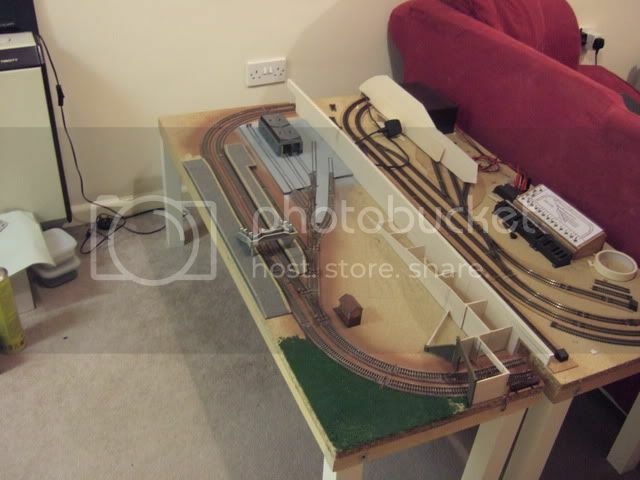 I reasoned that a smaller, transportable layout, would provide a means of running my fleet and, at the same time, allowing me to develop my modelling skills. 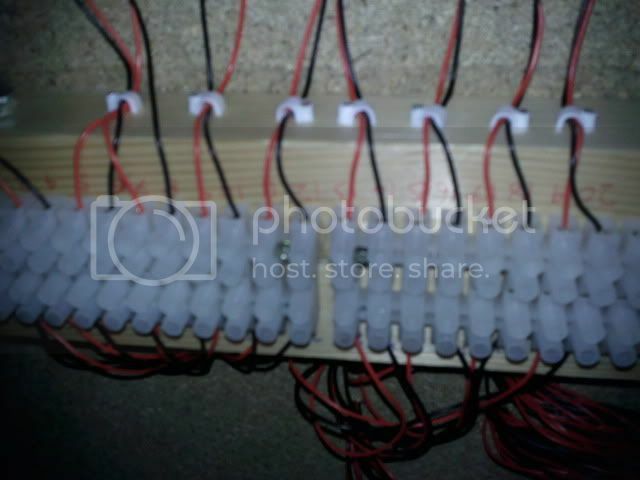 • Sectioning of a layout / DC wiring. • And, eventually, signals and lighting. 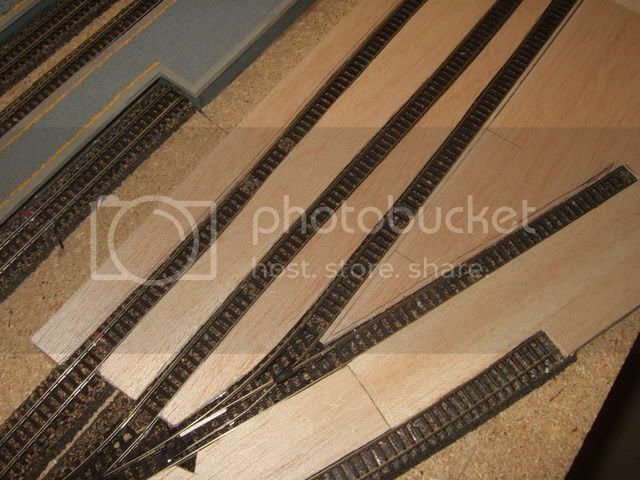 Here are some photos of the early stages, so you can get an idea of the track plan and loco fleet. 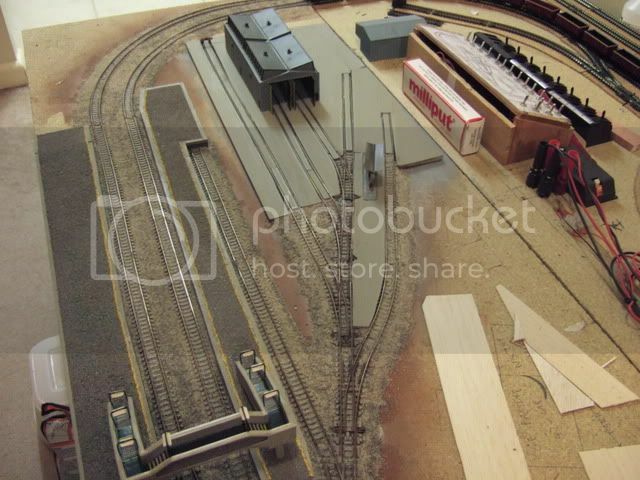 The layout has come a long way since then, but it was over 4 years ago! Know what you mean about being impressed and aprehensive. There's a lot of really good modellers on the forum (don't regard myself as one of them..maybe in a few years) but that doesn't matter. Learning and having fun is what it's about, and I've found all the stuff I've read and the comments I've received very helpful. Really like your intro - and agree on the HST noise! Would like to see some pics of where you are now with the layout!
. . . I think the “Swallow” livery suits the HST the best and Network SouthEast is great on just about anything! Seriously, welcome to NGF and believe me there's no need to be nervous - no-one cares on here if you are a complete beginner who doesn't know their A4 from their elbow, or a know-it-all who really DOES know it all We're all here to help each other get the most out of N Gauge. If you haven't seen it already try the following video - especially the throttle-up at 1:49 - pure heaven! First of all welcome to the forum and nice little intro to your layout thread. 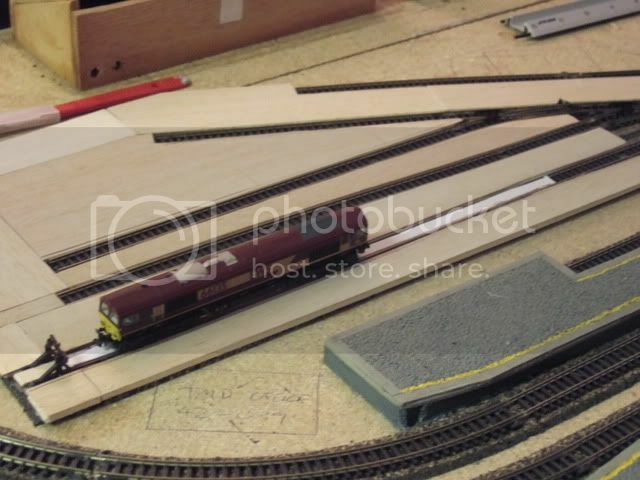 Feel free to ask any questions on this forum and look forward to seeing your layout as it progresses. Oh the sound of a Paxman Valenta start up and those turbos!!! I can't quite figure out which I prefer HST's, 37's or 47's, but then again variety is the spice of life. Remember today's experts where yesterdays beginners. Thanks for the kind words of welcome. Flattered :-D And thanks for the video, many HSTs in the livery of choice. Where was this filmed? Yep it’s Skyline as in Nissan...in my case the R34 but since the new GTR arrived I think I have a new favourite! No I don’t own either, GT5 is the closest I am likely to get! And as for the last Video...is that supposed to happen?! 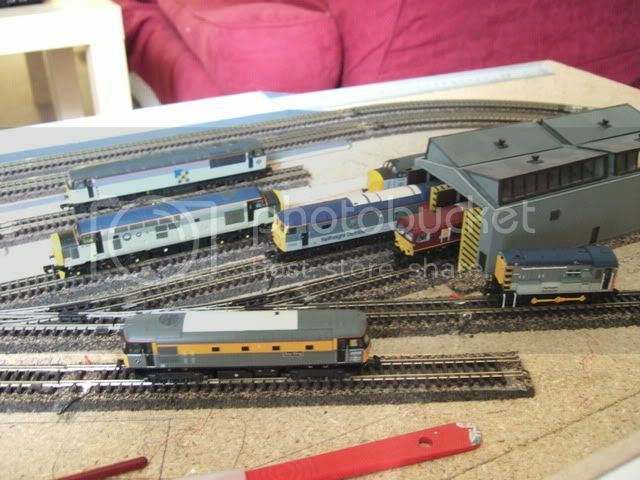 Ok, so Filton TMD is currently in its fourth home, and as I type half-assembled in the front room / workshop of my house. 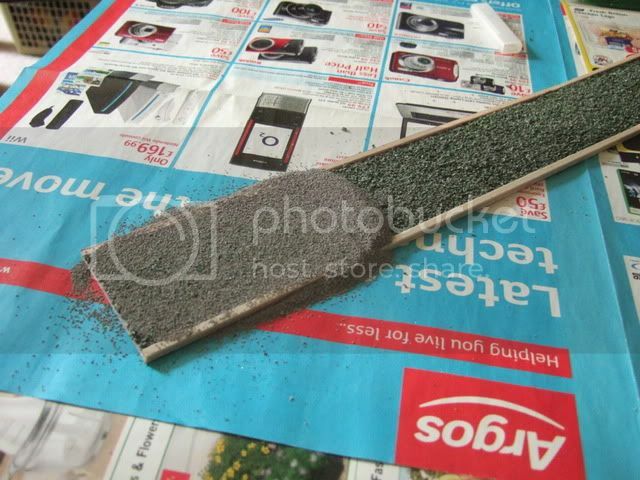 Progress in the first house was broken off just after cork track-bed laying and test “grass” patch. 2nd home came and went with TMD not seeing the light from under the stairs. Incidently, the cross-baseboard joint was dealt with electrically by use of these fantastic plug and socket connectors from Amberly Services. Amazingly this worked perfectly first time. 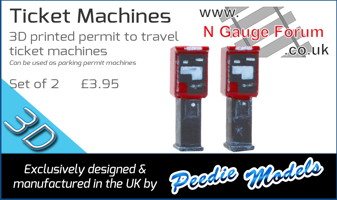 I was so shocked that I immediately decided to correct operational issues that arose with my initial plan of manually controlled points (namely, I could not be bothered to keep moving!). The whole point of Filton TMD was to “display” my locos in a depot setting, but this was not going to be as much fun if I had to set routes manually. My research into point motors revealed that SEEP motors were available with built in accessory switching at no extra cost. So, my ambitions growing at an exponential rate....and having just discovered the CR signals website......I ordered more Peco switch racks than I needed. I also soldered all the point motor contacts with short length of wires connected to circuit blocks. This would make “phase 4” (signals) all the easier when I could afford it (that day has not come, but it’s not forgotten either). And thanks for the video, many HSTs in the livery of choice. Where was this filmed? Would love an R33 GT-R V-Spec meself, although I wouldn't say no to a new 'R35' as a gift Why anyone would want to pay six figures for a Ferrari, Lambo, etc when they could pay £70k and have the same performance, 4 seats, active 4WD and a decent boot beats me! I also soldered all the point motor contacts with short length of wires connected to circuit blocks. This would make “phase 4” (signals) all the easier when I could afford it (that day has not come, but it’s not forgotten either). Before I get too far into Filton TMD, time for some nostalgia. 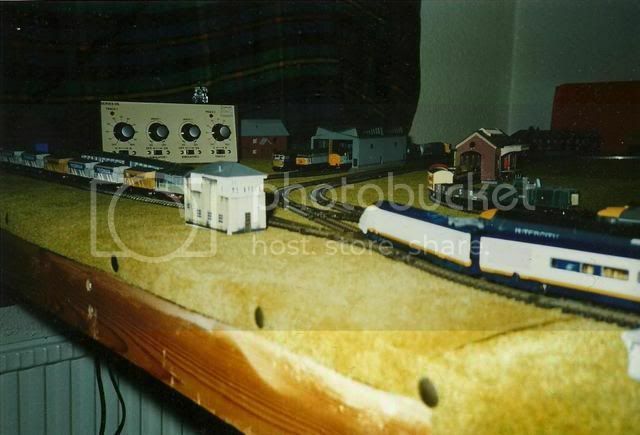 I came across these photos of my old layout recently, so here are some (scanned, so not brilliant quality) pictures of my childhood efforts. 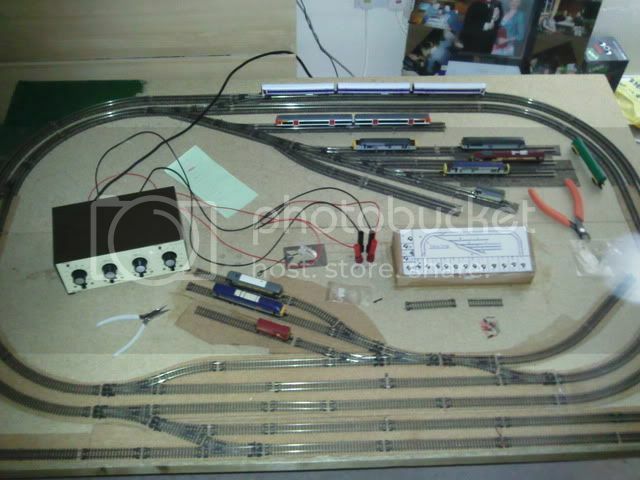 This is a general view of the layout and board. Before track was removed, the depot at the back grew two more roads and three more sidings plus long head shunt was added on the right, but very few (if any) extra buildings were added. 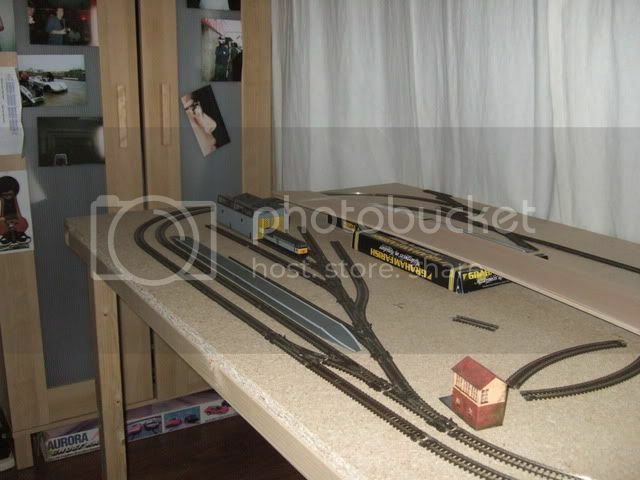 Note the HST on the left along with my most prized possession, a Kato Eurostar and add-on pack. 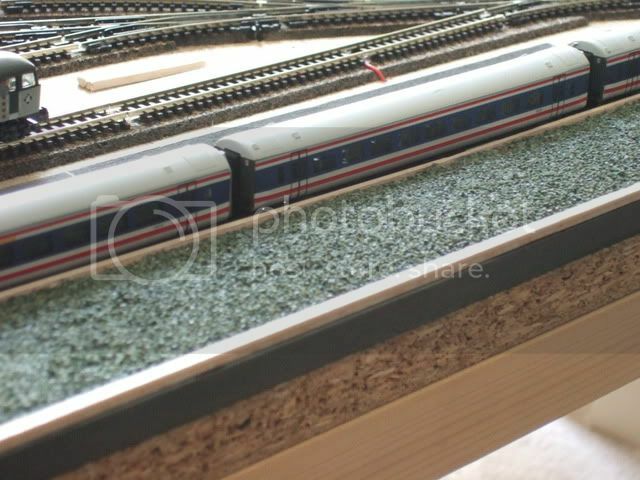 The HST eventually gained enough coaches to make up 7 MKII set. However, in my youthful ignorance at least two MKIII’s were in the older “Executive” livery, and I think a MkIV might have snuck in too! 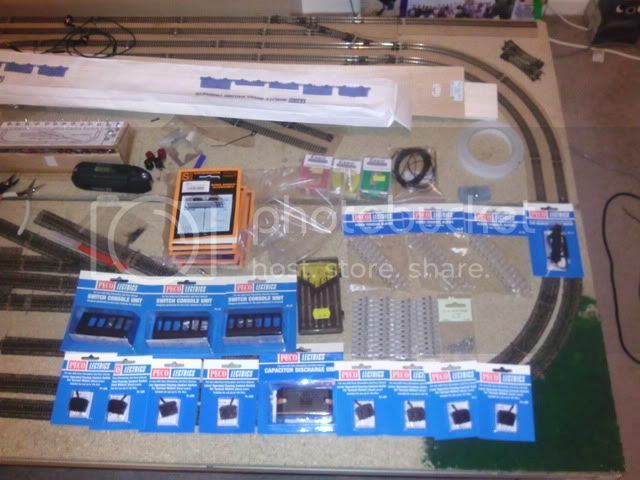 The next photo shows a line-up of motive power / stock. Some of this stock was on long term loan from a friend, and have since been returned. 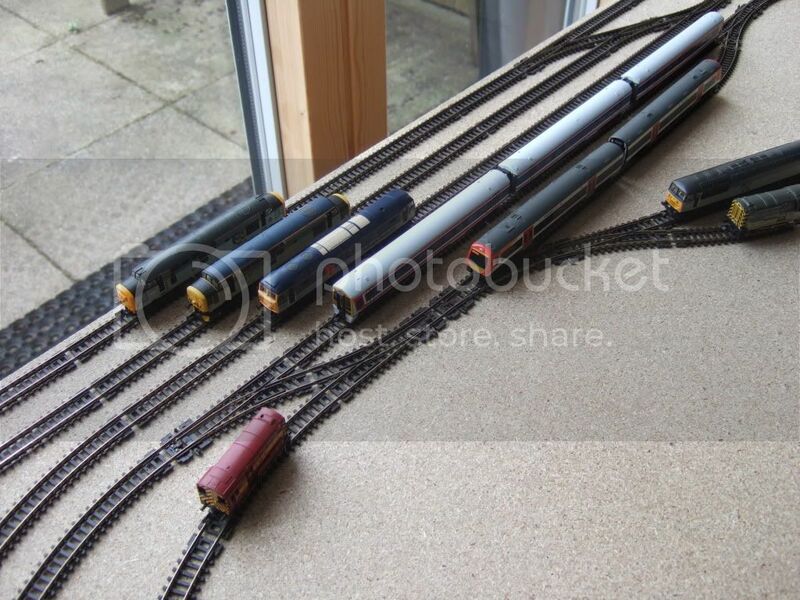 Early on in the planning and construction of Filton TMD, I sold my Swallow HST set on eBay. It was obvious it was never going to get the space it needed to run and was just gathering dust in a box. Also, after years of use (it was my third ever loco), it had began to show its age. It was a bit battered and not free running, so a (very!) detailed description on eBay saw it sold for a very reasonable price (for all concerned). It is a long term goal to replace this set with at least 1 full length Swallow train. Dapols new model looks excellent and I would be keen to see it alongside the latest Farish offering for a back-to-back test. Does anybody here own a Dapol unit? 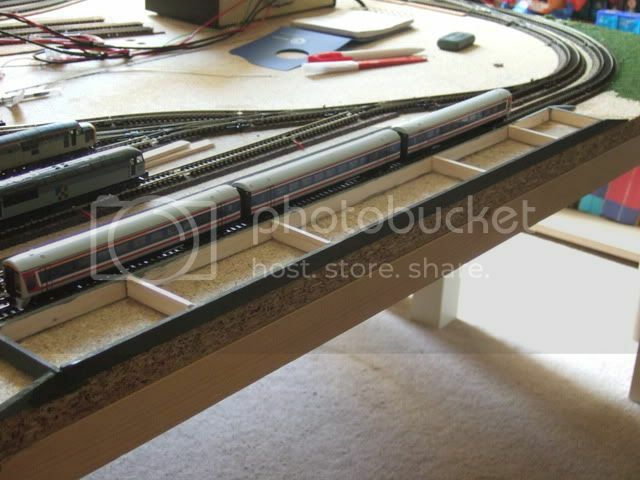 Is it possible now to roster a full rake using Dapol MKIII’s? What’s verdict on the Farish offering? Has it been re-tooled or is it just cosmetic updates? Sorry for the many questions, but when (or if!) I ever finish Filton, my next project (space providing) would involve mainline HST running. In the mean time I will console myself with my boxed “Original” great western Cream and Green Farish HST. This, in my humble opinion, is the 2nd best livery to ever appear on a HST. Oh, and before I go, the Eurostar is still mine and I am keeping her! Electrical work completed I turned to the scenery. The track plan had been partially conceived to work with the scenic items I wanted to include (and partially to use the pointwork I used on my previous layout! ), so I knew roughly where everything was to go. First up, after the green “splodge” on the right hand end, were the platforms. I was keen to expand on a technique I first tried in London. Keen observers of my previous post will see my first ever home-made platforms on the left side of the layout. These were made using Balsa Wood, painted grey to represent concrete. The method proved to be much more cost effective than purchasing Graham Farish items, even with several versions succumbing to the aforementioned parental unit and her obsessive cleaning! With the platforms of “Filton West” (as the station was to be christened), I took the concept further and added “concrete” tops using grey, extra fine, Woodland scenic ballast. Photos of the construction are shown below. The finishing touch was to hand-paint the yellow “warning line” on the platform edges. The first efforts proved to be far too course, and in my opinion even the current “extra fine” ballast is too course. I may attempt to correct this in the future as a friend has some very fine sand used for her Chinchilla sand-baths, and I might have to ask her where she gets it! Hideous gap at the joint with the ramp on the end was quickly corrected! As I type this, I have just finished a session painting my station fencing and benches. My Graham Farish footbridge (shown above) has also been re-painted to make it fit in with the (hopefully not too..) overwhelming NSE Red theme! I may post pictures of this as a sort of “on my work bench”, though that may give “spoilers” of where the layout is today! Looking forward to seeing the red paint. Re: Filton TMD...an ongoing saga...School-Boy Error Alert! At the beginning of what should, hopefully, be a day full of modelling for me. I have a mind to do some "On my work bench" style entries to show current "mini projects" for the buildings on Filton TMD, but the depends on progress today! 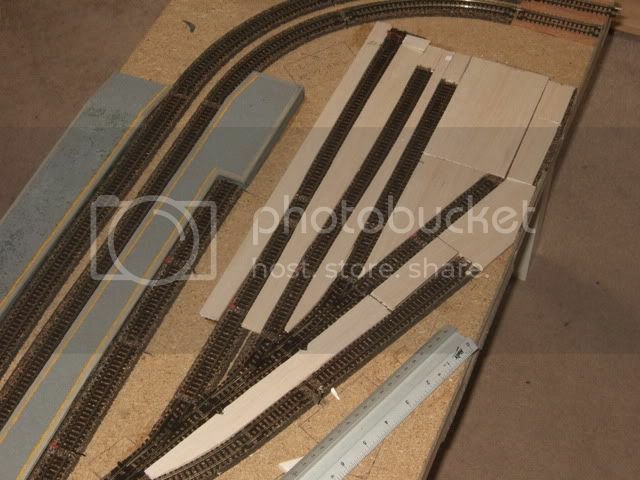 In the meantime, here are some more photos of layout construction, along with the (first of many!) "school boy errors" that have occurred along the way. The focal point for Filton TMD is, obviously, the maintained depot itself (in this case the classic Peco diesel shed). 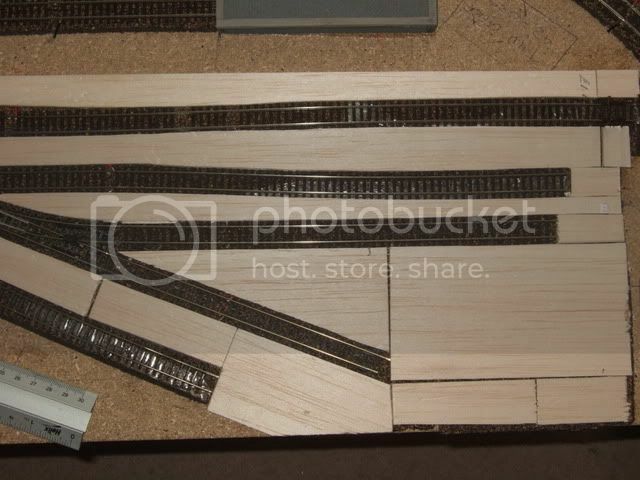 Ever since I obtained my first one of these kits I have experimented with creating "concrete covered" or "inlaid" effect track. For Filton TMD, I decided to use a technique developed on my old London set-up. Again this used my old stand-by, Bulsa wood :-). 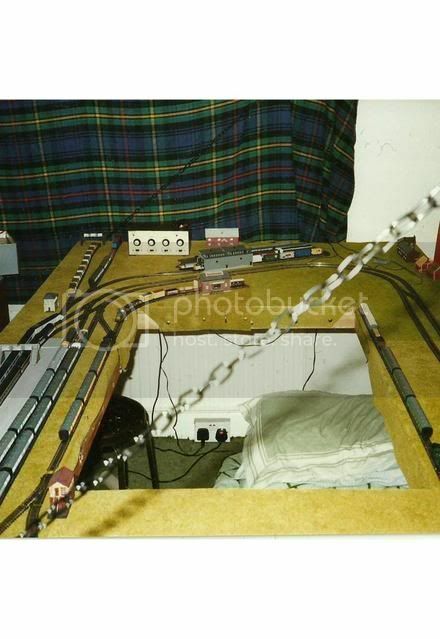 However, whilst it was successful in London, that was using dead-straight Peco set track, over a lot smaller area. It also only had a token covering of grey paint to represent concrete. On Filton, I tried to be much more ambitious. All was going well until I painted it. Firstly, the "grey" undercoat spray promptly turned blue when dry! Secondly, the Bulsa has curled, warped and lifted. It’s not awful, but having seen numerous examples of plaster-covered rails on this forum and in person at Exhibitions, I am now certain it was the wrong way to go. 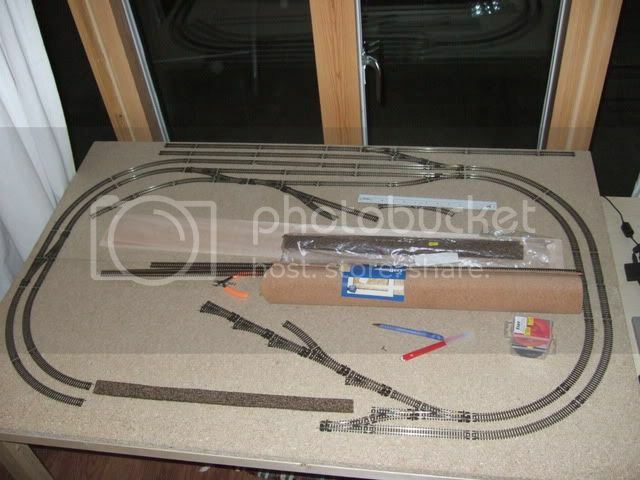 I even met one chap at Warley 2010 that made very good use of some good quality cardboard. Mine has been improved somewhat with the use of Milliput, but my eyes keep being drawn to bad bits. In the end the whole lot may well be ripped up and re-done. So there it is, my first ever tip on this forum. Don't use Bulsa for your hard-standing!